It's no secret that I'm all about the books. To say we have a few is a vast understatement. "Stubby" by Marion Borden with illustrations by Art Seiden (one of my favorites). Not sure where this book came from ... it might have been in the big book grab box or the local thrift. 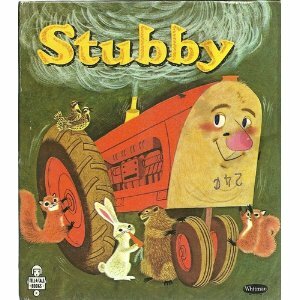 After close to three weeks of reading it daily, Stubby had to go into hiding. Sorry Stubby. Copyright 1963. The book did bring some debate to our dining room table. Is it a sweet tale of a tractor looking out for the animals around him or the vast capitalistic machine intent on mowing down the little guy? You decide. "Big Red Barn" by Margaret Wise Brown was also read again and again. It was a favorite with Joseph last year too. The classics "Good Night, Gorilla," "Goodnight Moon" and "Brown Bear, Brown Bear, What Do You See?" were also on heavy rotation throughout the year. "Sheep in a Jeep" by Nancy Shaw. I can quote this one in my sleep. Joseph has fun acting it out. "I Took the Moon for a Walk" by Carolyn Curtis and Alison Jay was under the tree last Christmas. But it wasn't until about mid-year that Joseph warmed up to it. The pictures are wonderful and the text so relaxing. I love all our Alison Jay books. "Diary of a Worm" by Doreen Cronin. The "Click, Clack, Moo" author does not disappoint. "Sir Toby Jingle's Beastly Journey" by Wallace Tripp. A thrift store gem from 1976, I'm glad I brought it home. Now mommy too had some must reads for 2011. I fell in love with the "Hunger Games" trilogy. I've read all the books at least three times now. Looking forward to the movie showing in March 2012. Any reads of your own to recommend?